Quick question for all the people that have played multiple seasons from the lower reaches.. I have just completed my first season in Level 10 and was able to offer part time contracts to all players... I won promotion to level 9 and now can only offer Non-Contract offers. is this a known bug/issue? I don't know if it is exactly your situation, but check it out. Or start your own bugs thread and have SI look at it. They should be able to tell you why this might be so after looking at an uploaded saved game. Unfortunately, I'll be managing an amateur team for quite a while yet so won't be able to encounter this situation anytime soon. It seems to be based on what the creators of the database set for the different leagues, because you can set it so a league forces the highest level of contracts available, and I noticed that this database seemed to be a bit scattershot with how it had been set. 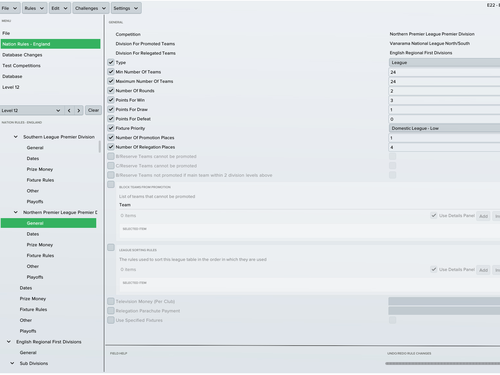 I went into it myself and set the contacts available to leagues to part-time contracts up until the likes of the National League, and that fixed the issue. Sadly, changing the database will only change new games, not your current one. Thanks for the info. I looked at the leagues in question and both had no contract types set, so really shouldn't have had an issue. 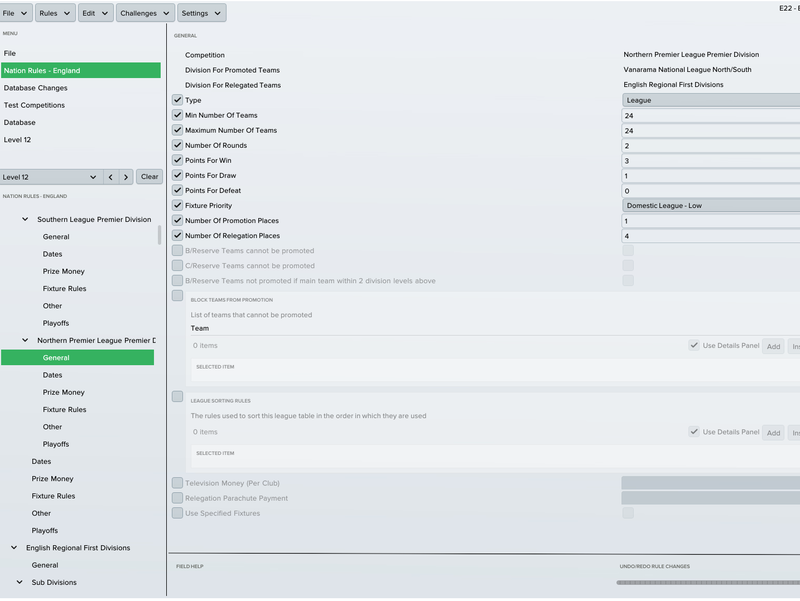 But I sort of fixed it by using the IGE to swap any Non-Contracts to PT on a single seasons term(max I could offer before) and just moved the appearance fee to weekly wage. I will start a save with Burgess Hill Athletic! 25 season ticket holders but the lowest average season ticket price. Well my dream of trying to get my reserve and third teams into the champ and league one is over haha. It appears I cannot get Cowfold reserves promoted from level 12 to level 11... despite my first team now being in level 9. Probably due to league rules about 2nd/3rd teams going up beyond a certain point in the pyramid, which is fair enough I guess. Do you think that the same rules would apply for a B team? Edit: Found how you can change this in the editor. Don't know what happens once you reach Level 6 (option is not available). Lot of clubs in Burgess Hill (in this file)! This club is a bug apparently. That's why the number of supporters are so high and the ticket price so low. There is another Burgess Hill in the editor that is not assigned to this competition. I feel a bit embarrassed asking this but i cant get my editor to recognise the database. I know i'm doing something really basic wrong. Ive downloaded the latest file then dragged it from the download file on my pc to the editor data file in my 2017 editor. However, when i then load up the editor and press the import file. the download is no where to be seen. do i need to do something before i move it from my downloads to the editor. Do you have other files in that folder? If not try to subscribe on a random expansion on the steam workshop to see if it's the right one. The editor data file that i dragged the download to, and the one which i tried loading from in the editor when i pressed import file did have one file in (both with the same name) but off the top of my head i cant remember what it was. Maybe config or something else beginning with c maybe. Anyway, ill give your idea a go when i get home to see if i'm putting things in the right file. Other than dragging it to the right place. Is what i'm doing already the right way to get the database? or do i need to do anything else with the download? I'm after some help/advise if possible please. 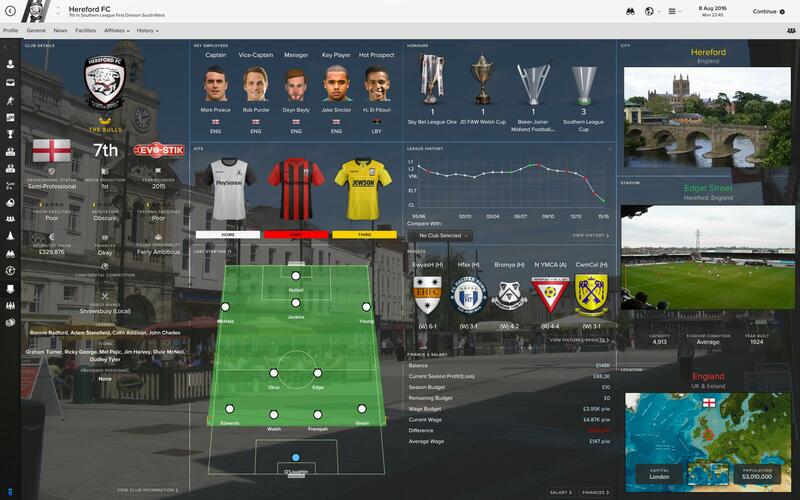 I have download a kit pack for the lower leagues. When I start a new game with just the original database loaded only, the kits show fine. When I start a new game with this file loaded, the kits don't show. Would anybody know what would cause the kit(s) not to show when this file is loaded? ^ Sorry if I'm being an idiot, but are you sure you cleared your cache and reloaded the skin? Have you checked the editor file to see if Hereford have a shirt, in the kits section? If no add a shirt (for both home and away if needed- seems as if 3rd kit is ok) and they should show. 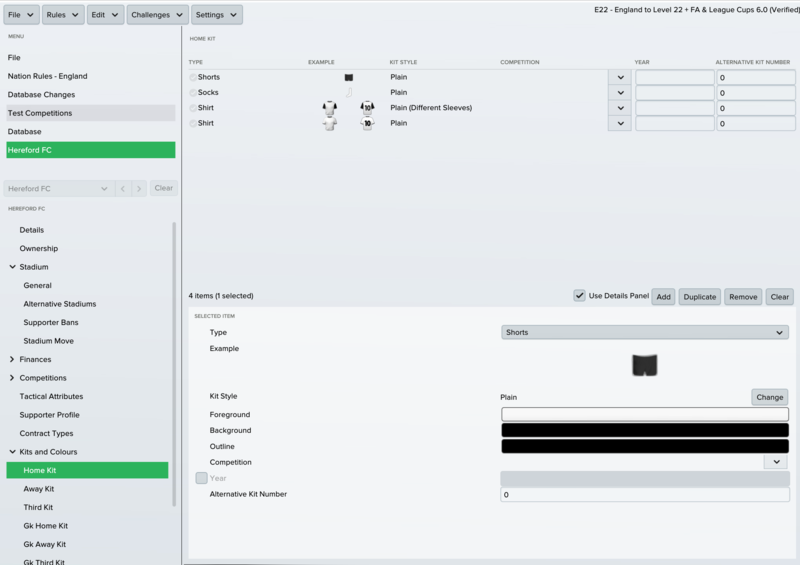 I found a number of clubs on this file do not show kits from kit packs and it is because the database/editor file doesn't have a shirt for the kit. Ok, so although in this database file Hereford do have home and away kits, they have 2 kits for each. I deleted one of the home kits and one of the away kits, saved the database ,started a new game and they are now showing. Strangely enough though, the default database had 2 kits for each home and away. Hi, thanks for this amazing file, will be downloaded tonight. Quick question: If I take a team based in the Essex Olympian League in level 11, where do they get promoted to? In real life it would be to the Essex Senior which according to your structure is in Level 9. Does that mean I would skip level 10? Don't do it - there is NO promotion or relegation from that league! Thanks for the reply. I will just start from the Essex Senior in level 9 instead then. Ive finally had chance to have another go at adding the database and ive found i was doing something daft. 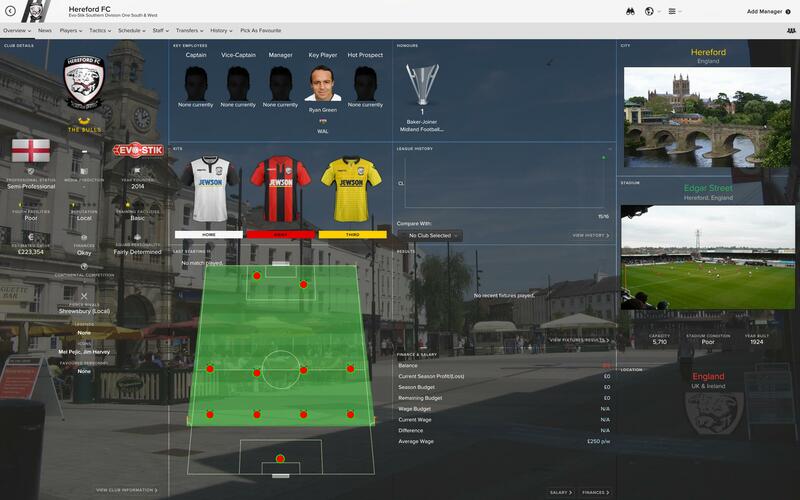 I was putting the download into the editor data in the FM17 Editor, not Football Manager 2017\Editor data. Got a question and an error to check on. I started a game as manager of Nostell MW in the Northern Counties East Division 1 and they have their home ground put as Cougar Park in Keighley which has a 7,800 capacity. I checked their details and found that they actually play at the Welfare Ground in Crofton which has a 1,000 capacity. And this leads to the question, as I got promoted in my first season and in the second season I went on a ridiculous FA Cup run to the 1st Round. Most of my matches were played at home and they all had a near capacity attendance, 7000+ where League is 200 max, which has resulted in a significant financial benefit, over £700k in the bank. When I looked at the away matches, these resulted in attendances that were 4-5 times the normal league attendances too. Anyone else spotted this happen to them?? Is there a way to get just a smaller version of this? Like just down to the County Leagues Level? I really love the quality of this file, but if I use any other data updates with this, it messes up. You have an amazing file here! Thanks so much for your hard work! You can just load less leagues if I'm not mistaken? Really enjoying my Burgess Hill Athletic save! Can't wait to beat Burgess Hill Town. Thank you Dan for saving FM17 for me. I noted an anomaly earlier that could be part of the same bug. My club started in level 12 and are currently at level 9. The attendances started at circa 40 for home games and are now around 100; away games depend on the opposition but are quite believable. The first team gates constantly run at a loss. The weird part is my U18 side which I put into the level 22 division. While between 2-20 turn up at away games, at home the lads pull in around 3000 supporters! 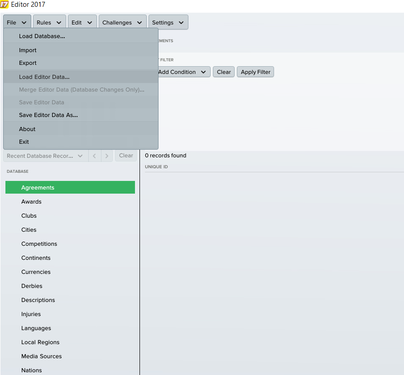 It's completely crazy and doesn't half fill my coffers, funding training ground upgrades. I did spot you mention this anomaly before and did look at my U18 and u23 teams, but as they play in standard leagues for their type, their attendances are very low as expected. My anomaly seems to be localised to the FA cup only as FA vase and local cups have lower than league average attendances. I could really need these anomalies! Just as a matter of interest, have you used the IGE at all in your game? I did use it in mine to fix the Non-Contract issue only, but wonder if using it might have an impact on creating these anomalies somehow. Not used it yet. I only made some changes with the pre-game editor (No Brexit, B team Burgess hill Athletic in level 22, B teams could possibly be promoted up to championship and more rivalries for Burgess Hill Athletic). I have no money but I'm having a blast, the B team is spicing up my save TBH. Just loaded up my save after a bit of a hiatus. I'm in my 3rd season (18/19) and see my 3rd team are set to play a UEFA Youth League 1st Qual. Round game against Vfl Wolfsburg U19s for some reason ... They are still at Level 14 and didn't win a cup or anything so no idea why they are in it. Quite funny to see the thirds in a big european cup though! Will report back when we inevitably get thrashed. I just looked back at previous seasons and Roffey 3s and Maresfield Village 3s were in the cup the two years previous... playing the likes of Valencia U19s and Fiorentina U19s . bizarre! Yeh, I do use the IGE - like you for 'contractual reasons and also to fix the club rep bug, but my issue was there from the start of my career, before I used the IGE. I'm not saying it's exactly the same as your issue pompeyboyz, just that there are attendance anomalies in the file (or SI hardcoded program at this level). Tullem - that is REALLY bizarre! I have a good team but I find it strange that nobody is trying to steal my players. Does this file include Morpeth Town? Does anybody know why when I edit anything in this database (like number of subs in each comp) then retest the rules to validate them. The FA cup final always gets played at the home teams stadium and not Wembley? Anyway to stop this from happening? Just started a new save for Heath Rangers. I'm in it for the long haul. So to that end, I need the club badges or its gonna break my immersion big time! Does anyone have logos for the clubs at these lower levels or do I have to put them in myself? And if its the latter option, then how do I go about doing that? 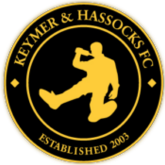 Someone did a Keymer & Hassocks kits and I think logo because K&H have been playable in this file for 2 or 3 years now. Heath Rangers are new to this year so no one has done one yet. However, it's quite easy to do. I'm no graphics dude but I nicked a logo from an unused club to make my own bespoke club's logo. You just go into the folder with the logo and config file and change its ID number to that of Heath Rangers. First of all, wow! Thanks for all your work!! I was wondering if it was possible to request additional leagues added in? The Anglian Combination Premier and Division One are in, but I would love to be able to play as the village I grew up in, who play in the Anglian Combination Division Four. I know its probably a lot to ask, but I'd love to have a go at playing them, if thats ok to ask for! Does this database work with any other country files or do i just have to use the other default country's in the game? I have tried it with Claasens packs and it does throw up an error if I try to use it with them all.